To start off my blogging journey this year, I will continue our Coron adventure last November. I am trying to complete my back logs so please bear with me. 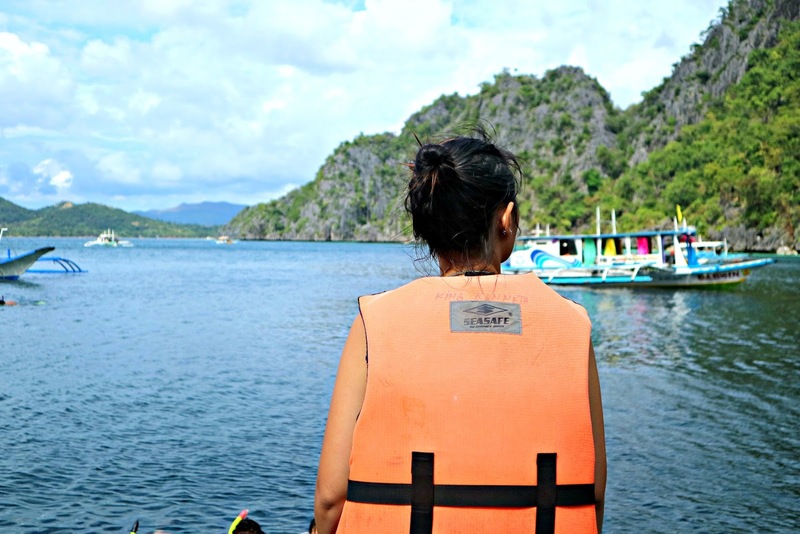 :) --- Our second day in Coron was so much fun and so much #beachgoals. Yes, it rained but it didn't stop us to have fun and be in the moment! As I was saying on my previous blog post, the storm was also in Coron the moment we landed there. And there's no other way but to pray for a better weather the next day. Waking up on our 1st island hopping day, I was already checking my phone from time to time to see if there's a notice from the tour agency regarding our island hopping.. if it will be pushed through or not. And it seems like God really loves me so much, our island hopping was pushed through! The weather was bipolar and it's raining from time to time but fortunately, every time we arrive in a tourist destination, it will stop for awhile so we can enjoy the view. This went on until the afternoon, though before our island hopping finishes, we can already see the sun peeking through clouds! 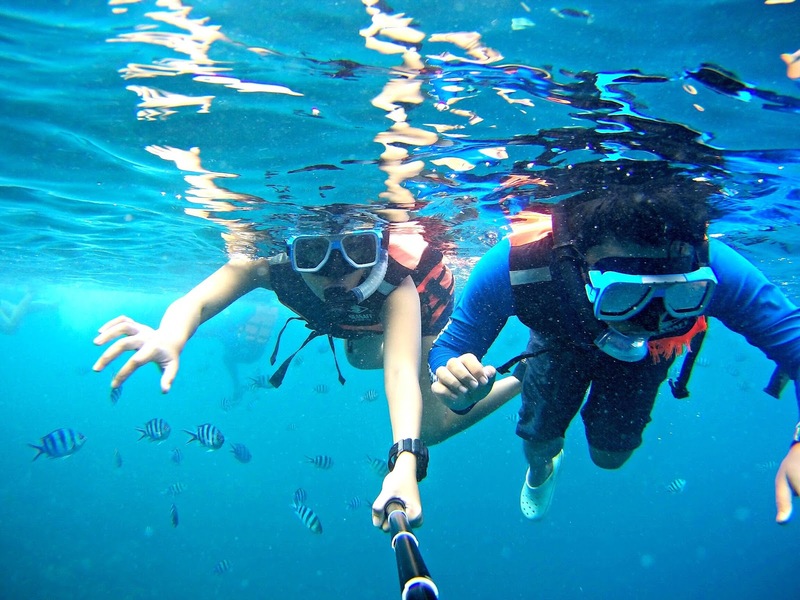 And since it is raining, the water on some of the tourist spots are not clear enough to go snorkeling. But needless to say, it was still a pleasant day. 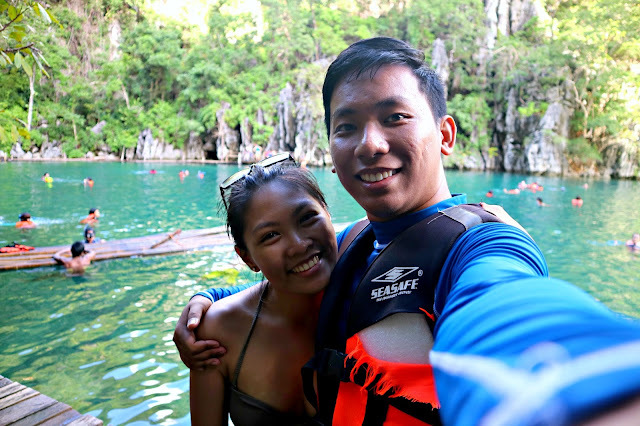 Our itinerary for the day: Kayangan Lake, Twin Lagoon, Siete Picados, Smith Beach, Skeleton Wreck, CYC beach, coral garden, and Green Lagoon. It was all awesome but my two favorites were Twin Lagoon and Kayangan Lake. Green lagoon is actually not part of the itinerary but our guides are kind enough to bring us there because we weren't able to enjoy Siete Picados as it was not clear the time we went there due to the rain. 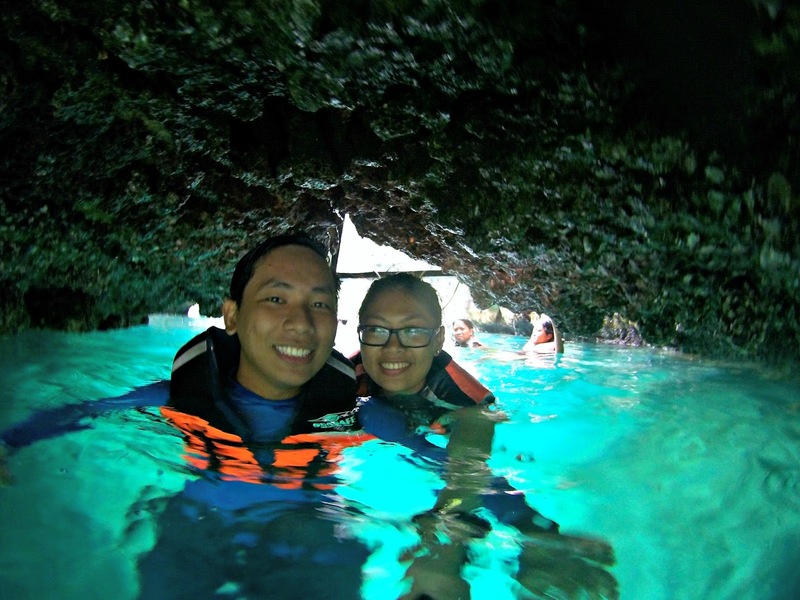 So to make up for the unfortunate event, the guides brought us to Green lagoon which we also enjoyed. Our first stop was Twin Lagoon. 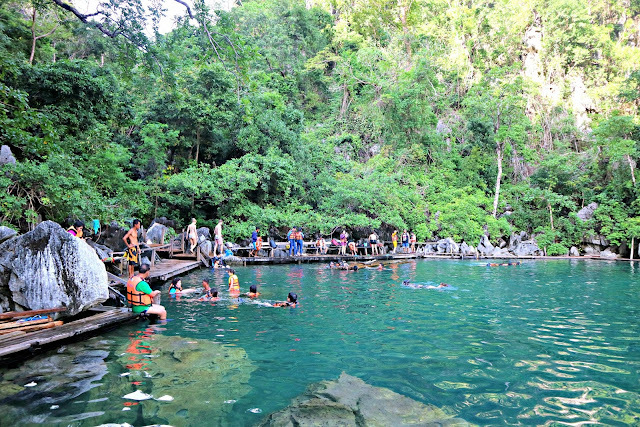 It was called twin lagoon because it is divided by a majestic limestone. 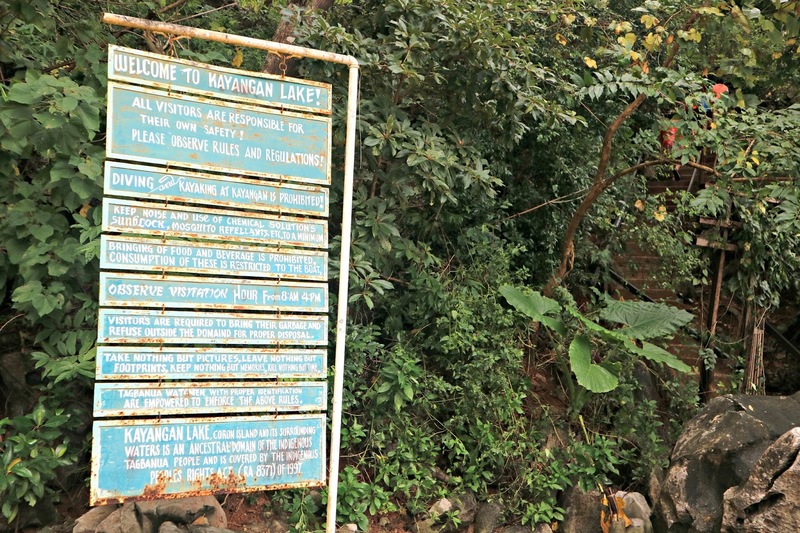 The first lagoon is where the boat docks. Upon approaching the lagoon, you can already see how beautiful the scenery is. The water is turquoise blue where the temperature is divided into two. Since this is where the salt and fresh water meets, some parts of the lagoon water is cold while some parts are warm. And to be able to go to the other side, you have to swim through a small opening under the limestone. Once you entered the other side.. ta-dahhhh! The surroundings are so nice. You can already feel that Coron is definitely one of the best island and beach around. I hope I can see this kind of scenery everyday but of course living in the metro, that's not possible. The small opening where you have to swim in order to go to the other side of the lime stone. Our second stop was the Coral Garden and CYC beach. It's just beside each other. We snorkel in Coral Garden but since it was raining, we can hardly see the fishes swimming. They said there are a lot of sea urchins but being me having poor eyesight, I was lucky enough that I survived without stepping on one. One of the highlights of the island hopping that I liked is the skeleton shipwreck. They say you can already see the ship without actually diving because of how clear the water is. But then again, since it was raining, the ship isn't really visible unless you go under the water. There are a lot of fishes too that you if throw in bread crumbs, the fishes will gather and come at the crumbs. This made up for the not so nice experience we had at Coral garden. In here, we can actually see the fishes and the corals. This is also where we had our lunch! A la boodle fight! 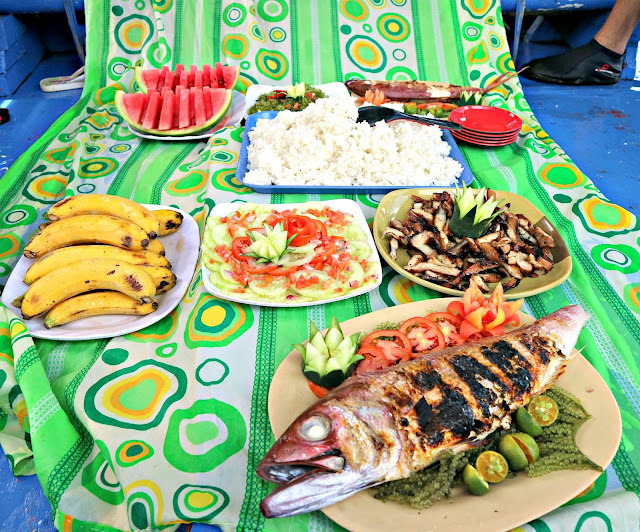 Well, not really boodle fight but I love how we ate at the boat and the food is in the middle and we just have to help ourselves for the serving. Our lunch spread! This actually comes in two set, the other set is not included in the photo. The people we came across during our island hopping. Good times and fun company. This is also why I love the beach so much!! It's very relaxing! Island hoppings are the best! Snorkeling in Skeleton Ship Wreck. 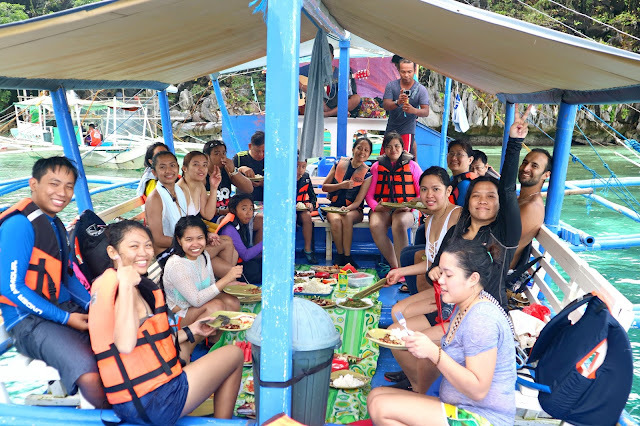 Just imagine how nice would it be to have a siesta right after having a scrumptious lunch but no, there's no time for siesta as we're headed to Kayangan Lake next! 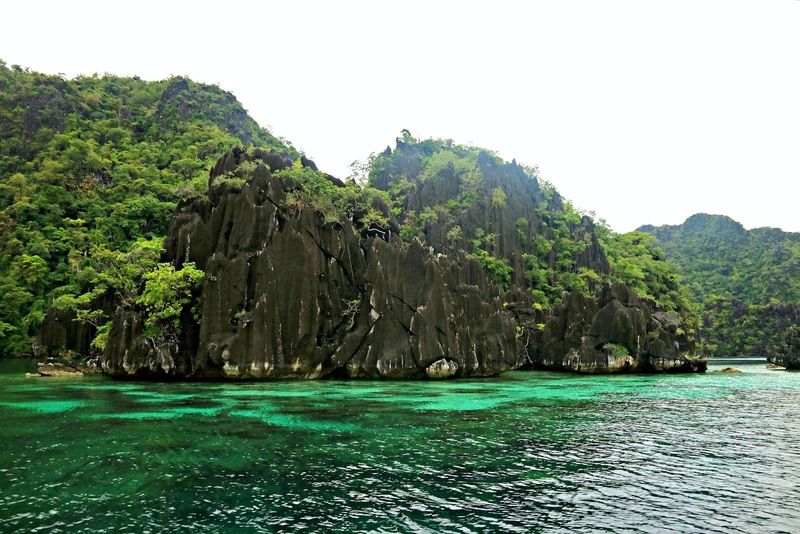 And this, my friends, is one of the best prides of Coron! My pictures can't give justice to the real thing so I suggest you really visit it one day. It's definitely a must visit! Though in order to go to Kayangan Lake, you must first climb a flight of stairs. No worries though because it's not that high. Plus there's a spot for picture takings with the majestic view. Mandatory couple selfie because it's both our first time to travel here. Yay! Last stop was the Green Lagoon. We just killed time and enjoyed the rest of the remaining time we have. They also served bananacues (banana covered in caramelized sugar) for merienda.. partnered with hot coffee. I'm really missing the island life right now. And so there. That concludes our first day of island hopping. It was really fun! How much more if the weather is nicer, right? We're hoping to have Kuya Bernie as our guide for the next day but unfortunately, he's not our guide. It's also impossible for us to be in his boat because he said he doesn't work on Sundays. Oh well. As the day ends, the sky is already clearing up and some stars are already visible. Which means, we'll have a wonderful weather on our next island hopping! yayyy.. but that's for another post. 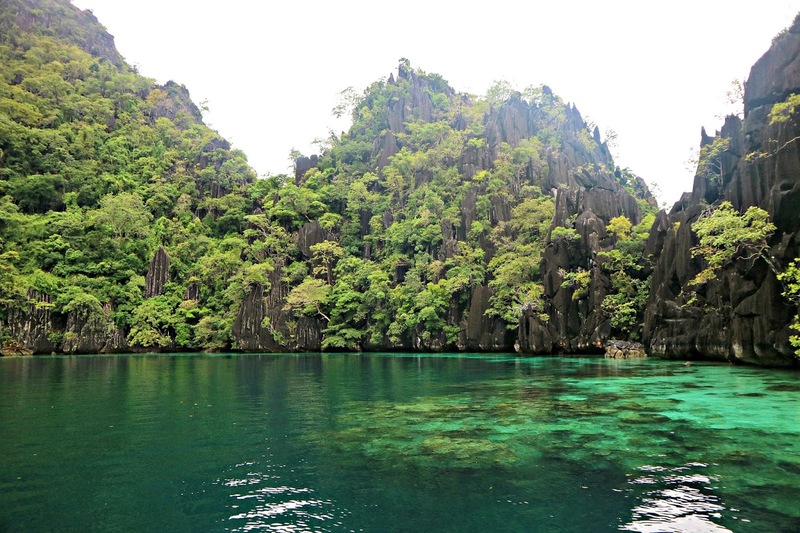 Oh, I happened to read another post on Coron also. I was mentioning in the other blog how I used to go to Coron and had dived in all the wrecks there. 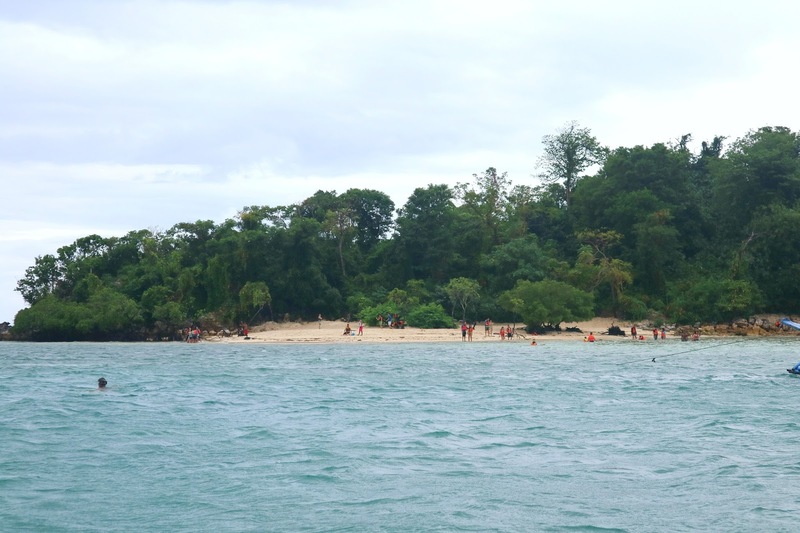 Were you able to see the gunship which is near the shore and snorkeling is fine? Glad you seem to look like having a grand time. It was one of the better places I have visited in the past. It sure brings a lot of memories back to see your photos and read your post. 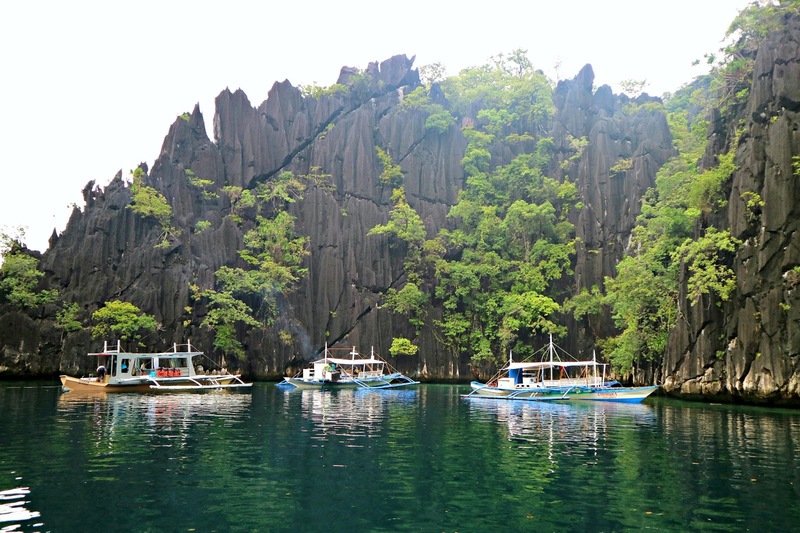 Oh Palawan! Cant wait to be there. Already booked a flight later this year. I guess I'll just have to drool on your lovely photos for now. I think I can still hold on hehehe. Seems you had so much fun. I am visualizing I am standing on a cliff overlooking the crystal-clear water. 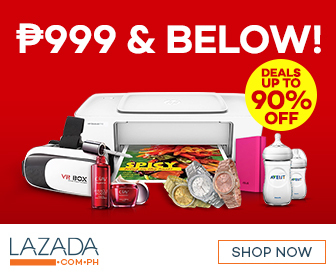 Is Coron beckoning me to return? I mean I just saw another post about Coron and now I'm here reading about Coron again hahaha... 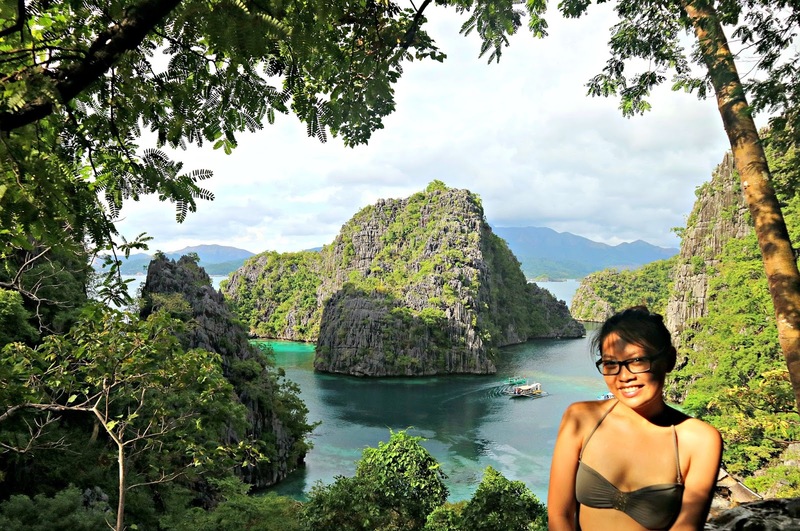 But I definitely wouldn't mind coming back because Coron's beauty is so mind blowing (especially Kayangan Lake, that one is surreal) that I'd be a fool not to want to return. The lagoons are absolutely stunning! I cannot believe the color of the water. The food looks delicious too, especially the fish. It looks like a great trip, and I am glad you did not step on a sea urchin. Oh, Hello Coron! I am missing you a lot. Too sad we did not able to meet there (though I don't know when did you visit coron). I'm kinda inlove with their little city, though I never though that its just a typical little town who has lots of in. I remembered met a local and he was too cool enough to share some tips on how am I gonna lessen my expense teeheehee :D How I wish I can travel here too with my hubby! Solo traveling is fun but its much more good having a trips with the one you love. I'm glad you enjoyed your travel. Looks so magical! The water is of such a soothing color, I can dip myself there now. You did have a grand time :) Saving up this place to my list of dream destinations. Coron will always be a cherished place in my heart! 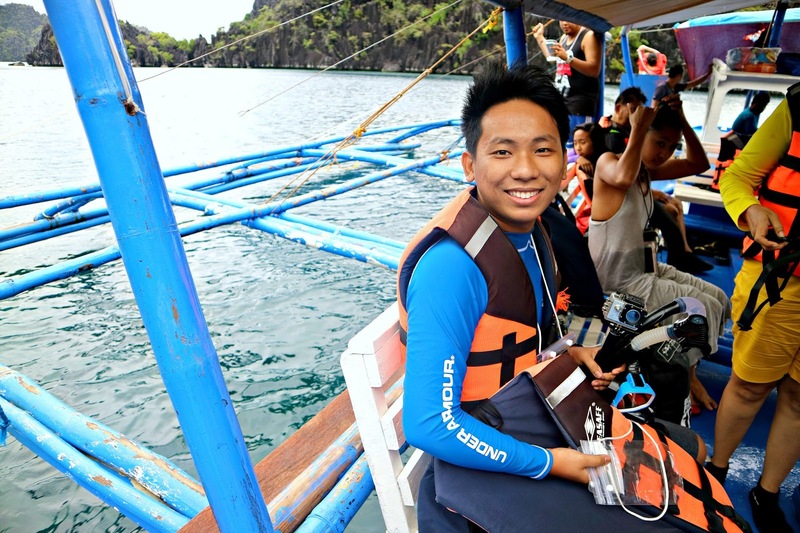 I really enjoyed my Coron trip many years back. Until now, I can still remember the hike towards the Kayangan Lake. 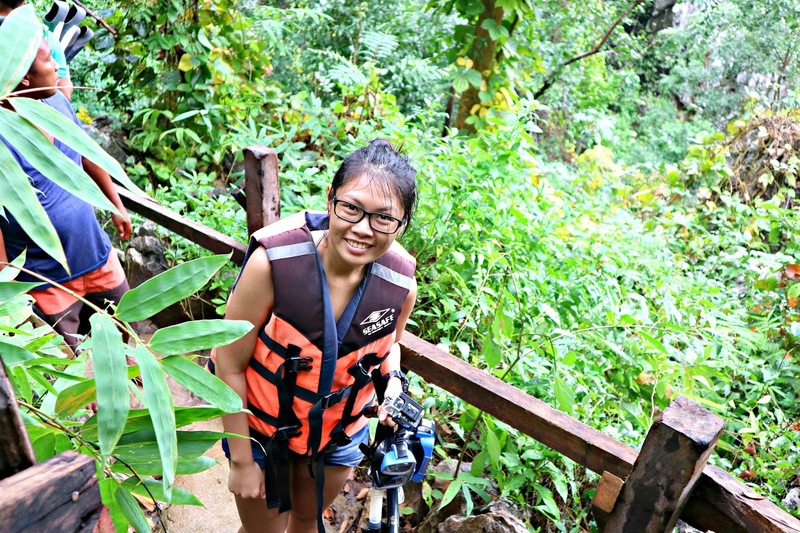 I was initially scared to go inside the cave but gave in to peer pressure and decided to give it a go and I enjoyed it! Big risks, big returns so they say. I can't wait to go back. 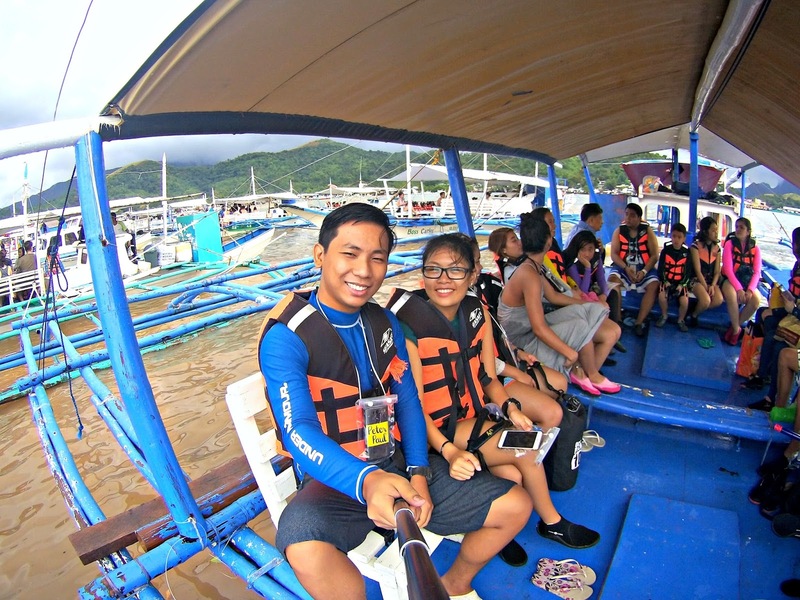 Thank you for sharing your island hopping photos. Just saw another post about Coron. Hmm... is this a sign?! Wow, Coron looks so gorgeous! The waters are so clear and blue! I really want to visit Palawan one of these days. I was actually planning on going for my birthday but decided that I would rather save money for now. Maybe someday! 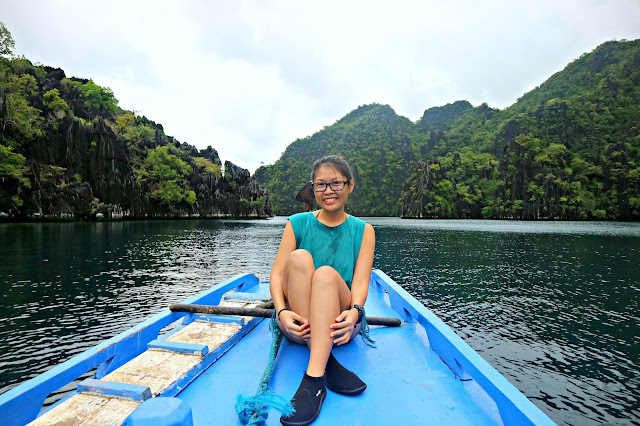 It reminds me of Halong Bay in Vietnam, but I heard Coron (or Palawan in general) is even nicer! 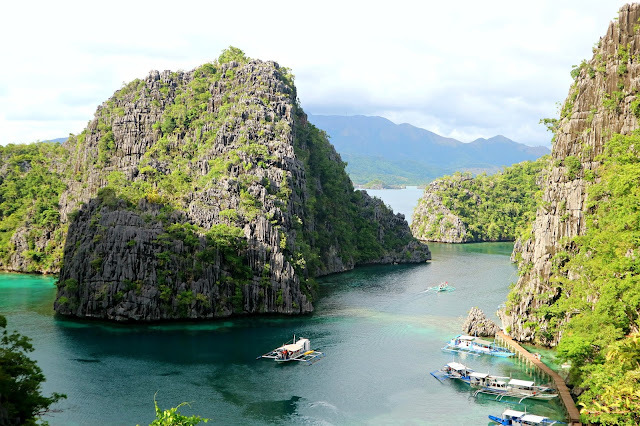 Oh my gosh, if airfares are cheap, I am hauling my little family of 3 to the next flight to Coron so we can see this paradise firsthand! Everything looks majestic and amazing. I just wish I can score affordable plane tickets so we can visit this place soon.